When Are The ACA (Affordable Care Act) Open Enrollment Dates For 2018? The 2018 ACA, also known as Obamacare, open enrollment season runs from Thursday, November 1st through Saturday, December 15th. Keep in mind that open enrollment for other kinds of insurance, like health plans offered by your employer, may be different. Individuals selecting health plans can enroll with Prescription Hope at any time of the year, even outside of Obamacare open enrollment. It is going to be more difficult than previous years to enroll in health insurance through the ACA. Formularies are shrinking, out of pocket expenses are being hidden, and premiums are going up! With all of these changes that can make it more difficult for you to sign up, here are some helpful tips on enrollment and how Prescription Hope can cut your medication cost. When you are signing up for insurance there can be a lot of different terminologies that may or may not be important. Some of the most important information you must look for is exactly what you will be expected to pay for. If each expense is not clearly laid out and added up then you can quickly sign up for something you are not prepared to pay for. You must know your health insurance plan’s premiums, deductibles, copayments, coinsurance, and your out-of-pocket maximum to determine how much you will end up paying throughout the year for your care. Have you ever walked into the pharmacy and tried filling a prescription only to discover that it is not covered by your insurance company? This is a direct result of your medication not being on your insurance plans medication formulary. A medication formulary is a list of prescription medications that your health insurance plan will cover determines how much you will pay for each of your medications. Learning what your options are ultimately determines if you will end up paying full price for your medication. Here is what you will need to know to make the most out of your prescription coverage. How Do I Make The Most Of My Formulary? In theory, medication formularies are made to save money for you and the insurer. In many cases, medication formularies can be a hassle. Tiered formularies may require you to meet certain criteria before coving a “higher tier” medication leaving you unable to get your medication. Also, if your medication is not on the formulary it makes it even more complicated and expensive. Quantity Limits: An insurer may limit the number of medications you are able to receive. Each Insurance Plans Formulary Is Different: Each plan’s formulary often changes year to year. If you had a plan that worked previous make sure to verify the medication formulary has not changed before resigning to the same plan during open enrollment. Specialty Restrictions: You may be required to fill the prescription through specific pharmacies. Doctor Request: Your doctor may need to request approval through your insurer to prescribe you the medication. Step Therapy: Step therapy is where an individual will be prescribed a different medication in an attempt to lower the cost of their medication. Regardless of your insurance plan and if your medication is covered, this does not guarantee that your medication will be affordable. 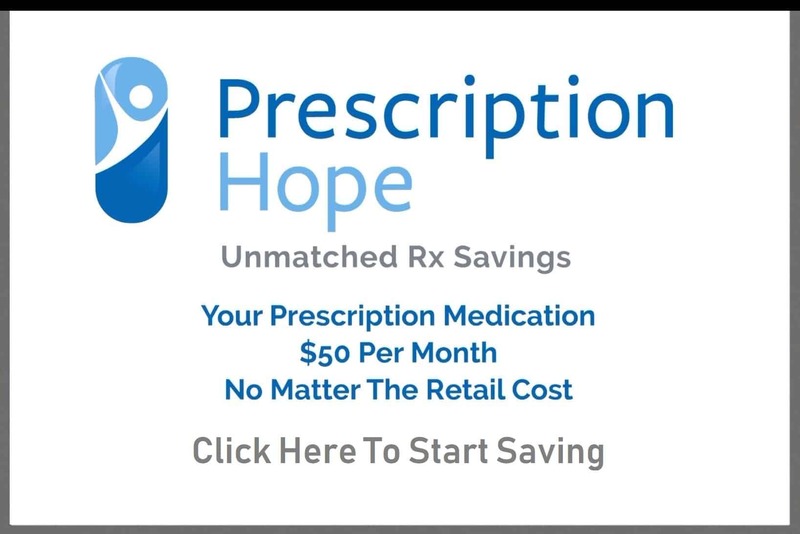 Prescription Hope offers over 1,500 medication all for the set price of $50 per month for each medication. This covers 100% of the medication cost, no matter the retail price. We can offer each medication for the set price of $50 per month by working directly with over 180 U.S. based pharmaceutical companies and their pharmacy. Prescription Hope works for those who are insured, uninsured and those on Medicare.